POLO AND MY CURRENT COWBOY HERO!! The Ace High authors over at Wild and Wicked Cowboys kindly offered to host me, so I’m movin’ the campfire this Saturday, March 23rd!! Hope y’all will join me over there where I’m jawin’ about Polo in Wyoming and how it helped me create the hero in my current WIP! 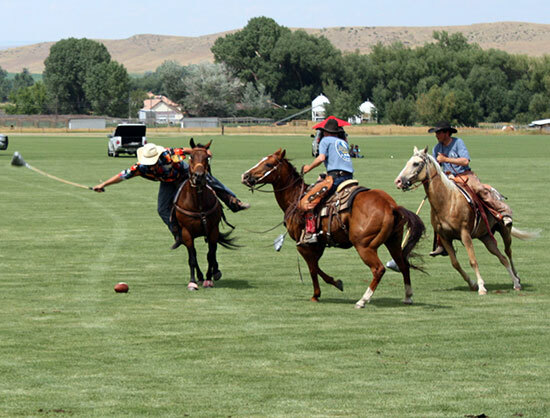 For your enjoyment and as a thank you for stoppin’ on by, here’s a couple pictures from last summer’s Cowboy Polo match between the wranglers of two dude ranches here in the Sheridan area! Each player was required to drink a can of beer, then play the first chukker. After a brief half-time, another can of beer and another chukker. The ball was destroyed during the first chukker, so the second period was played with a fooball. I live in the Fort Worth, Tx. area and did not realize that polo was still being played in Wyoming and Montana. I played polo with the Arlington Polo Club, Arlington, Texas. We won the Championship Trophy in 1972 in Greeley, Colorado. Missoula, Montana had a team there and they were really tough. Our team disbanded about 1978. I was talking with a friend and past polo player and he had been to Spur, Tx. and visited with one of the original team members that brought polo to Texas and changed the name from Palmetto Polo to Cowboy Polo. A woman from Spur came up with the idea. She moved to Florida where they started the game and called it palmetto after a type of palm tree. They made the mallet shaft from the palmetto. If you can sent me any information on number, location, etc. Of teams in Wyoming, Montana and other states.